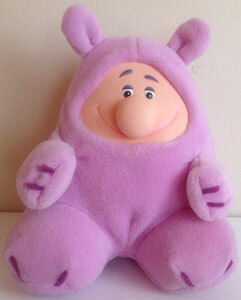 Images on this page thanks to various eBay sellers, ameblo.jp and Hasbro publicity!! "Your emototronic friend! 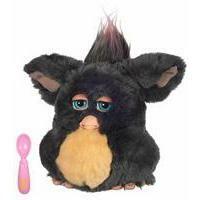 The more you play with Furby, the more he does! 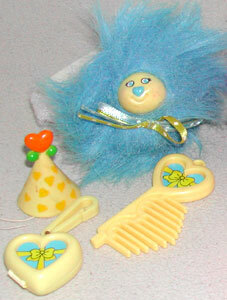 He loves to play and can tell you jokes, play a game, sing, and even dance! Bring him home today and he'll be your best friend!" 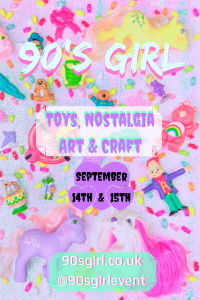 "Emoto tronics means that I can show you my moods through my facial expressions and the tone of my voice when we're playing together. Watch my moods change from happy to sad, upset to hungry, sleepy to shy and more!" Hey! 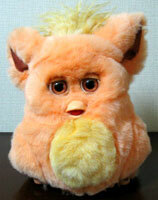 I'm Furby! the more you play with me, the more I do! 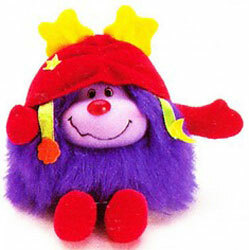 I love to play and can tell you jokes, play a game, sing and even dance! I can smile, frown and my beak moves when I speak. 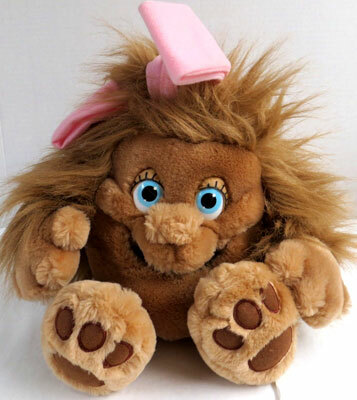 I speak Furbish and you can help me "learn" English. 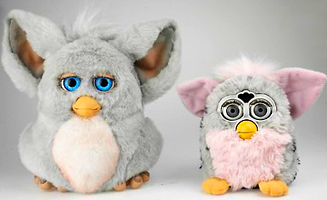 Furby's were redesigned by Hasbro in 2005. 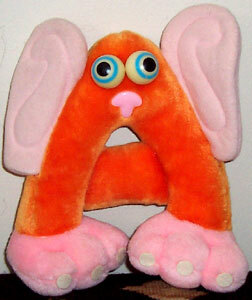 They were bigger than originals at 9" high, had rubber beaks, plastic feet, larger ears and more detailed eyes. 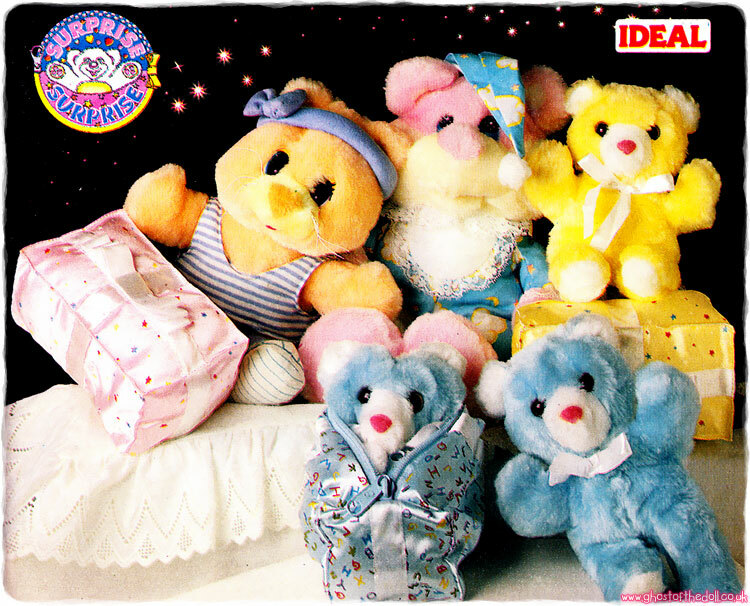 They came in at least 15 different colours with a choice of eye colour too. 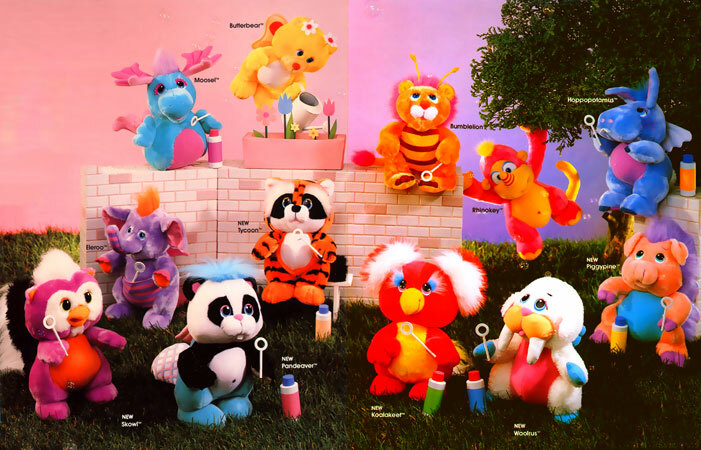 Unfortunately the re-issues didn't sell well due to poor voice recognition and the hard competition of the interactive toy like Furreal Friends. Each one came with a spoon they could "eat" off. 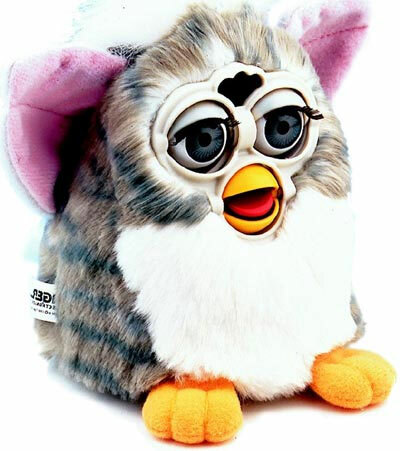 The re-designed Furby no longer had a sensor between it's eyes. 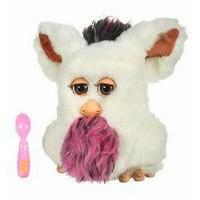 "Meet Furby - a cuddly little creature that wants nothing more than to be your best friend! 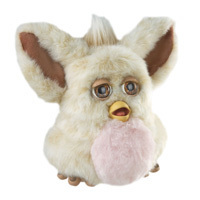 Take Furby home with you and start to play… At first you’ll hear only the Furbish language, but as you interact, your friend will “learn” English and talk to you, tell jokes, sing, dance… even “converse” to other Furby pets (sold separately)! Moving eyes, ears… even a working beak show you changing moods! 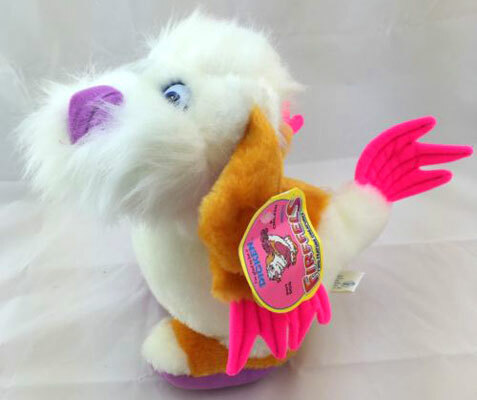 With the ability to speak hundreds of words and “understand” dozens of phrases and commands, you’ll be amazed at what this wild and wooly new friend can do!" 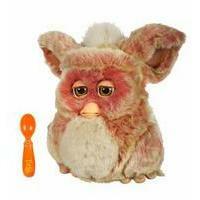 "Funky Furby can sing polyphonic songs, tell jokes, dance to music and understand your commands! 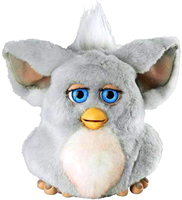 Everyone remembers the original Furby; pint sized critters that were loved by all. 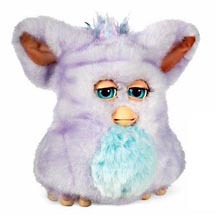 The new Furby species is from Furby Island and can show emotions with special emoto-tronic technology allowing it to smile, look sleepy or sad. 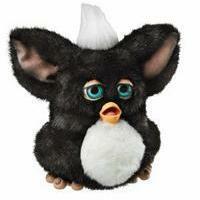 Funky Furby is a lot more fussy than the original 1998 Furby but does have an off button! 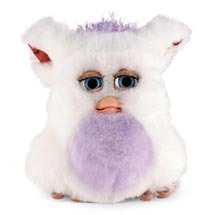 To talk to Funky Furby just call out "Hey Furby" and it will respond with "Doo?" 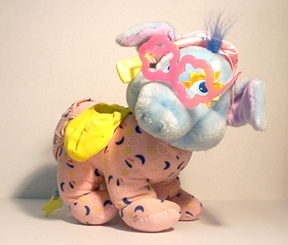 which in Furbish means "What?" 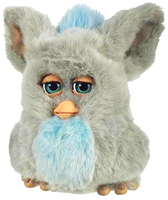 Now you can tell Furby to sing a song, dance to music and more! 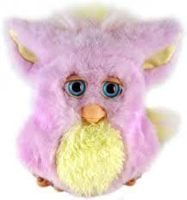 Funky Furby talks in its own special language which is called Furbish! 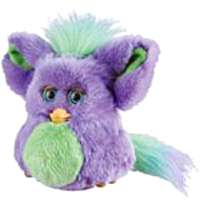 When Funky Furby first meets you it will talk in Furbish but becomes fluent in English very quickly. 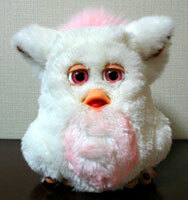 You can talk to Furby in English or try Furbish yourself! Eye and Spoon Colour may vary." 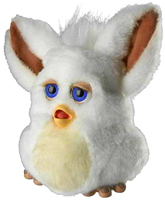 There were three Funky Furby's produced, sold in Canada, Spain, Italy and UK only. 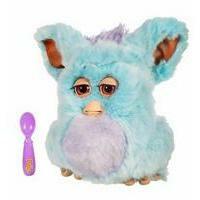 The blue/purple Funky Furby was only sold in Italy. They had unique speech and could be taught to dance and sing 3 songs when music was played. 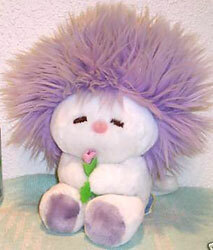 It also has a long tail with multi-coloured streaks in it. "You can feed me with my bottle and I'll stretch and wake up!" 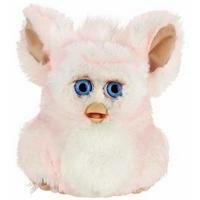 Baby Furby's (of which there were four) were smaller than the adults, with larger eyes and jointed legs which straightened when the baby woke up. They had less interactive features than the adults. 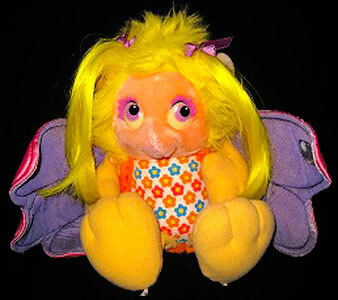 They were sold in shops in Europe, but only via the Hasbro website in the US. They each came with a bottle and a variation of eye colours. 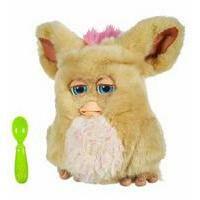 "It’s Furby Baby - a cuddly little creature that wants nothing more than to be your best friend! 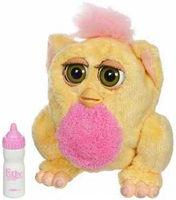 Take Furby Baby home with you and start to play… “Feed” Furby Baby its bottle and watch it stretch and wake up in your arms. 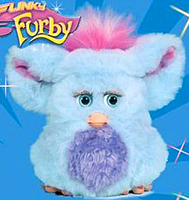 It laughs and cries -and can even “converse” with other Furby pets (sold separately)! Moving eyes, ears - even a working beak that shows you changing moods with Emoto-Tronics! Watch its moods change from happy to sad, upset to hungry and more! 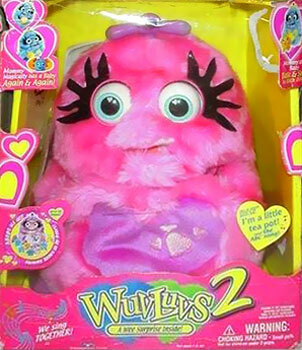 You’ll be amazed at what this wild and wooly new friend can do! 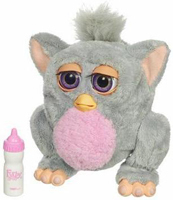 Electronic Furby Baby friend is a cuddlesome interactive pet that blinks its eyes, laughs and cries, “drinks” from its bottle and more!"